So if it's supposed to find rare and out of the way things, how does it do for the Caucasus? We did a quick self test. For Caucasus and data, it does indeed return us on the very top, or at least in the first line, and it's a nice interface, as you can see. However, it also shows choices that are at least somewhat eccentric. 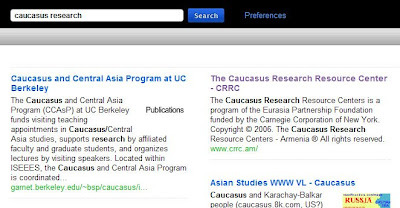 We get a somewhat similar picture for caucasus research, but again it seems to favor our Armenian website. The Georgian or Azerbaijani office are not immediately in sight. The preference for Armenia is a little odd, since our English language websites in the three countries are practically identical (and similar to the regional site, too). 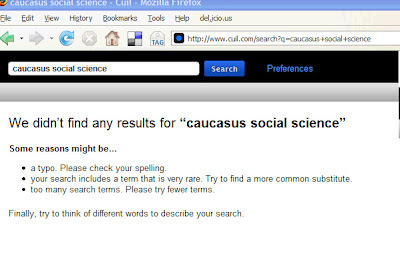 What does it do for Caucasus and social science? Note we did not put the words in quotation marks, so it's a free search term. There is some irony in this conclusion, but we don't think it's entirely fair. And can it help with more specialized requests? We queried CRRC's own Survey Director, Tina(tin) Zurabishvili. 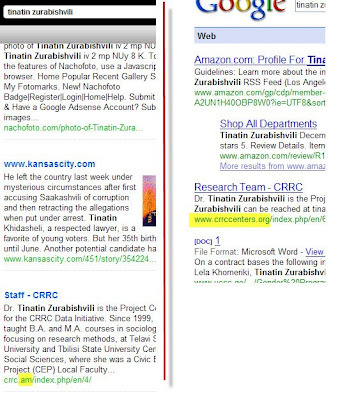 Here you see a comparison of Google and Cuil. Cuil gets it, but again takes us to Armenia. It also throws in a lot of chaff on Salome Zurabishvili, or Tinatin Khidasheli, two Georgian opposition figures. So Google still seems ahead here. 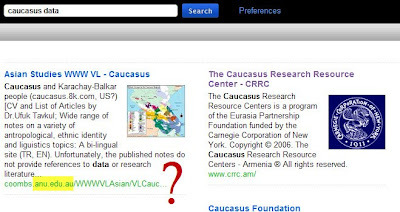 As far as we're concerned, Cuil is an interesting additional tool if Google doesn't find what you're looking for, but not yet a serious alternative for internet research on the Caucasus.